After my post about the Lava Era, most of you commented to say that it’s not just a Hawaii thing, which I found hilarious. How do these universal kid games spread? Is it word of mouth when a kid moves? Are they born with such games in their heads? Let’s see what the reaction is to another example. The “Friends” thing seems to be really popular with my two munchkins too, especially in the last two years or so. If I say no more dessert, I get a very terse and mopey, “You’re not my friend anymore!” or “I not your friend!”. Buddy’s thing now is when his feelings get hurt, he’ll go sit somewhere making a big pouty face and simply say, “Nobody’s my friend…” as in, no one loves him. I’ve tried to tell him that Mommy will always be his friend, but I guess when Mommy tells you to stop talking during Survivor, even that everlasting friendship doesn’t seem real. Today’s bento is actually part of a product review I’m doing on the box. 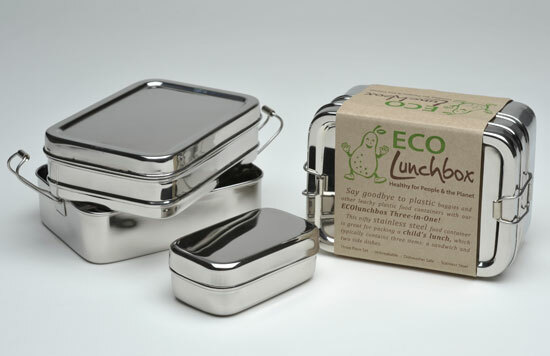 Sponsored by ECO Lunchboxes, this two tier metal tiffin comes with a small snack sized container. Based in California, ECO Lunchboxes carries two different types of stainless steel bento boxes, wooden and steel utensils, and an extensive line of attractive cloth lunch bags and napkins. You can follow ECO Lunchboxes on Twitter or become a fan on Facebook. Measuring 5 1/2″ in length and 4″ in width, this box is a fair size and when you consider that there are two layers, it’s actually quite big and therefore probably not a great size for small children. However, you can simply use the top layer and that makes a great meal size for the younger set, especially since you can also store an afternoon snack for them in the third side container. The metal prongs on the side of the box snap onto the upper layer and it’s actually moderately hard to open with food packed in the box. This is really good for keeping your lunch from leaking, but may make it hard for a small kid to open on their own. However, since I said both layers is too big of a size for that age set, it’s probably not a concern for kids. Thankfully, it’s manufactured in India, not China. My only complaint is that the sticker on the bottom of the box does not come off nicely. Mine is still stuck to the bottom with some of the paper gone and the adhesive still stuck on the box. This is a big pet peeve of mine, having that sticky stuff not come off. That being said, the box is very sturdy and a really good size for adults. It’s a nice box for fitting a sandwich in, too. At $20.00, it’s actually cheaper than many lacquer boxes and better for the environment. If you’re interested in purchasing one, the folks at ECO Lunchboxes have offered a discount that’s good until March 31st, 2010. Upon checkout, enter the coupon code ECOBENTO15 and the 3/31/10 expiration date. With Girl’s Day coming up next week on March 3rd, I’m continuing with my girl theme by making a little quail egg princess. While I was taking the photo, it occurred to me that this could be like the Princess and the Pea, only with edamame instead. 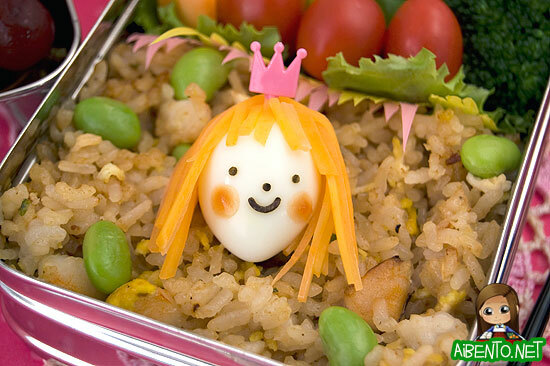 Just imagine that this sensitive little princess sleeping on a bed of fried rice is going to wake up with frazzled carrot hair because of those innocent little soy beans. 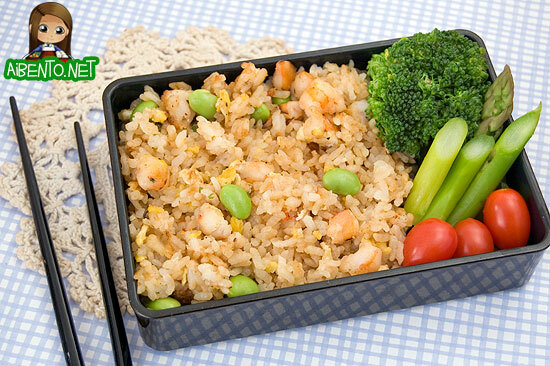 The fried rice is made with shrimp and a seasoning packet that I have for fried rice. It was my last one, so I’ll have to buy more from Marukai. I love the flavor! I added an egg and the edamame was folded in after I took it out of the pan so that the beans would keep their nice color. I boiled a quail egg and then cut a thin slice of carrot with my mandoline. I boiled it very briefly to give it more color and soften it up, then sliced it into very thin strips for hair. Her face is made out of nori and her cheeks made from ketchup. 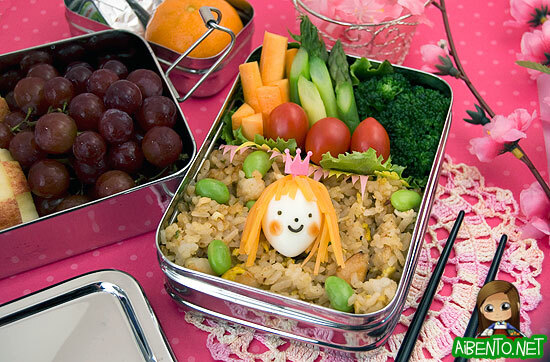 I packed a bento for Mr. Pikko as well, but it’s not all that attractive. I took a picture of it anyway though! Many thanks to ECO Lunchboxes for sponsoring this review. I now have another box I can use on Mr. Pikko!